Author of Early Horse Racing in Yorkshire and the Origins of the Thoroughbred (Old Bald Peg Publications, Old Byland, York; 2003). ©David Wilkinson, 2004. All rights reserved. The Vale of York, in the northern region Yorkshire, together with its side dales (of Swaledale and Wensleydale) and the Valley of the River Tees were particularly important in the development of the Thoroughbred. C.M. Prior, in the 20th century, noted that virtually all of the original 78 Foundation Mares in the General Stud Book came from this area. This explains the succession of Royal Studmasters from the local land owners; Roland Place of Lower Dinsdale, James D'Arcy of Hornby and Sedbury, Thomas Pulleine of Carlton Hall, and William Marshall from Selaby. Oliver Cromwell banned horse racing during the Commonwealth, in case of public disorder, but he was a keen horseman and imported expensive oriental horses, including stock from Aleppo, and six coursers from Naples at a cost of 2382 piastres. He was particularly interested in developing a light cavalry horse to replace outmoded chargers more suited to soldiers in heavy armour. After Cromwell's death in 1658, his studmaster Rowland Place (d. 1680), is thought to have removed one of these stallions to his own estate at Lower Dinsdale, on the Durham side of the Tees where it became Place's White Turk. Place was an unusual choice as studmaster for the intensely Protestant Cromwell, coming, as he did, from an avid Royalist family. He is also credited with the removal of an important mare, the so-called Coffin Mare, which he purportedly kept hidden in a Whitechapel cellar. D'Arcy's White Turk is later found in the D'Arcy stables at Sedbury, near Richmond, but such animals were rare and it would be unusual that two could exist within ten miles of each other. Place may have passed it on to James D'Arcy, who succeeded him as royal studmaster, or, as Mackay-Smith suggests, D'Arcy's White Turk and D'Arcy's Yellow Turk are the offspring of Place's White Turk. Prior proposes that these horses, when crossed with the mares located at D'Arcy's Sedbury stud, produced much of the foundation stock of the English thoroughbred. On Tuesday, 29 May 1660 Charles II was restored to the throne. A week later his attention turned to horse racing and he drew up a deed appointing James D'Arcy (the elder) of Sedbury, as master of the Royal Stud. James D'Arcy was the sixth son of the 4th Lord Conyers of Hornby, near Bedale, who had suffered during the Commonwealth for his Royalist sympathies. The D'Arcy-Conyers family is complex, with dynastic links throughout Yorkshire. Sir Thomas D'Arcy, father of Arthur D'Arcy who wrote to Thomas Cromwell, Henry VIIIth's chief administrator, suggesting Jervaulx Abbey as a royal stud, was executed for his role in the Pilgrimage of Grace in 1537, but subsequent D'Arcys overcame this disaster by a series of advantageous local marriages, which maintained their social position. James married Isabel Wyvill (of Constable Burton Hall) and received the Sedbury estate as part of the marriage settlement. Their daughter Elizabeth (d.1720) married Ralph Milbanke (1689-1748) of Halnaby and a granddaughter Elizabeth (1706-1739) married John Hutton (1691‚1768) of Marske. The marital links were mirrored in the interconnection of their horses, which assumes importance because of the unique nature of their stock [See D'Arcy family tree]. James D'Arcy was immediately commissioned to visit and report on the Tutbury Royal Stud in Staffordshire. James quickly informed Charles that the stud had been dispersed and could not be restored. However, he offered to supply him with "twelve extraordinary good Colts" for the considerable sum of eight hundred pounds a year from his own estate at Sedbury. Charles accepted, but the D'Arcy family was not always paid. 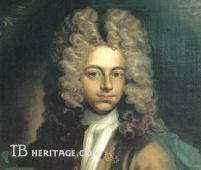 His son James (the younger) (1650-1731), later Lord D'Arcy of Navan, spent much of his life failing to persuade subsequent monarchs pay Charles' debt. In effect Sedbury became the Royal Racing Stud and was the stable of the so-called "Royal Mares." The Wyvills, from whom James D'Arcy acquired Sedbury, still live at Constable Burton Hall, near Middleham, in a delightful house designed by the Yorkshire architect, John Carr. They were associated with horses for centuries and intermarried with other key breeding and racing families. The Wyvill family, along with most of the North Yorkshire landowners, were staunchly Royalist during the Civil War and paid for their loyalty. Their estate was sequestrated and their house filled with troops quartered on them. Sir Christopher's granddaughter, Ursula, married Leonard Childers, of Carr House, Doncaster. Childers bred two of the seminal early Thoroughbreds, Flying Childers and Bartlett's Childers.Cuthbert Routh, a friend and neighbour of the Wyvills, in his studbook, compiled between 1716 and 1752, states the dam of Betty Leedes was "a famous roan mare of Sir Mar. Wyvill's ." This challenges the conventional GSB version of the incestuous origin of the dam of Flying Childers and Bartlett's Childers and is believed by Prior. If true, it would significantly disturb the foundation pedigree of the breed. This Sir Marmaduke Wyvill (d.1754) was Postmaster General for Ireland, and made an interesting marriage to Cary (d.1734), daughter of Edward Coke of Norfolk and Derbyshire, whose family were instrumental in importing the Godolphin Arabian from France. An important early horse owned by the Wyvills was the Belgrade Turk, who appears to have been obtained through the close relationship with the Coke family. Edward Coke spent a considerable period in Paris as a youth and was on close terms with the Duke of Lorraine and used to stay with him at Luneville. The Huttons of Marske, in lower Swaledale, through John Hutton (1691-1768), were the breeders of Marske, the sire of Eclipse,establishing them in the main stream of thoroughbred development. The family fortune was established by Matthew Hutton (1529-1606), Archbishop of York, who purchased the Marske estate for £3000 on behalf of his son. Subsequently lead mining in Swaledale was a source of considerable income for the family. Matthew Hutton (b.1597) married Barbara D'Arcy, the sister of James, and had to sell the entailed estate to the Conyers. The Huttons had difficulty in recovering the property after the Civil War when they had been regarded as the most violent Cavaliers in the county. John Hutton (1691-1768), the breeder of Marske, married Elizabeth D'Arcy (1706-1739) in 1725, built the stables and renovated the hall. Marske was exchanged when young and passed into the ownership of the Duke of Cumberland, who John may have known through his captaincy of the foot in the '45 rebellion. Marske was crossed with Spiletta at the Duke's stud in Windsor Great Park. Spiletta had been obtained from Sir Robert Eden of Windelsham in County Durham. Unfortunately the Hutton studbook, which would be invaluable in the study of early Thoroughbreds, is lost. Of the Yorkshire equestrian families the Milbankes are among the most interesting, with links to the national scene through Lord Byron and Lord Melbourne. Originally of gentry stock, they rose to aristocratic status. The family came from Scotland and left the service of Mary, Queen of Scots, in some disgrace. They moved to Tyneside where Mark Milbanke (1603-1677) became Lord Mayor of Newcastle in 1658 and accumulated a sizeable fortune. He was able to supply Charles II with large sums of money in exile and the family was rewarded with a baronetcy. They acquired Halnaby, near Croft, from Sir Francis Boynton in 1649, who in turn had purchased it from the Place family. The Milbankes entered this area of the Tees valley where horse breeding was the local passion, and set about emulating their neighbours by establishing an important stud. They supported the local race meetings at Richmond and Durham (where they were stewards) and entered horses at York, where they attended the elite northern society functions at the Assembly Rooms. They made good local marriages when Ralph Milbanke (1689-1748), almost inevitably, married into the D'Arcys through Elizabeth, a daughter of the royal stud master. Ralph's sister, Judith, married her Wyvill neighbour, Cuthbert Routh, (1694-1752) of Snape and Dinsdale; Routh bred important stock and trained on Wanless Moor, and kept studbooks, which are among the few early ones to survive. The Milbankes produced Annabella (1792-1860), the unfortunate wife of Lord Byron (1788-1824) and tormentor of Augusta, Byron's half sister. Augusta, with whom Byron had an incestuous relationship, was the product of her father's ("Mad Jack", Lord Byron, 1756-1791) first scandalous marriage to Amelia D'Arcy, divorced wife of Lord Carmarthen at Hornby. 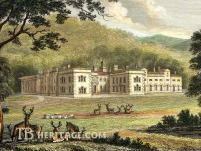 Ralph Milbanke's sister was Elizabeth, who married Peniston Lamb, 1st Lord Melbourne, in 1769. As Lady Melbourne she became the formidable society and political hostess who bore a child by the King and produced a Prime Minister in the 2nd Lord Melbourne. "...seen at Nappa, a house with towers, the chief seat of the Metcalfes who are reckoned this day (1607) the most numerous family in England. I have heard Sir Christopher Metcalfe, ye chief of the clan, was followed by 300 men of his own family and name, clad in his cloth and livery and all well mounted on horses when as high sheriff of the County, he rode out to meet the judges of assize and conducted them to York." The family was fiercely royalist and incurred heavy financial losses during the Civil War. Charles I visited Porch House, the family home at Northallerton, and later, as a prisoner in 1647, rested and attempted an escape from there. Thomas Metcalfe (b. c.1661) married Lady Faith Milbanke, nee Acclombe, widow of Mark Milbanke who died in 1698. Their son, William married a daughter of the Darley family and this probably accounts for his possession of Bully Rock (or Bulle Roch), by the Darley Arabian,a horse which ran with only moderate success at York, but was one of the first English thoroughbred stallions imported into Virginia. The Croft family of Barforth, near Gainford, just across the Tees in County Durham, were tenant farmers, and of a different social order to their neighbours, the Milbankes. 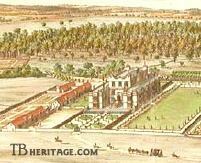 John Croft (d. 1729-30) had served the D'Arcys at Sedbury, and then established his own breeding operation at Croft. After a falling-out with his landlord in 1709, John Croft moved his family and horses to the Bouchier's Barforth estate. The Crofts, both father and son, also named John, were moderate participants in northern racing, but significant as breeders of many influential mares in the General Stud Book, and through their ownership of Partner. In 1729 John Croft obtained Partner from Mr. Pelham of Brocklesby in Lincolnshire. He was descended from the Byerley Turk, Selaby Turk and the Curwen Bay Barb and important as the grandsire of both Herod and Matchem (through his son Tartar). These two, together with Eclipse, represent the three most important prepotent sires of the mid-18th century with surviving lines. John Croft (the son) had the stud at Barforth, until in his old age his nephews, the Cornforths, took it over. 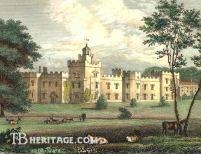 The Cornforths raced over northern circuits and the stud was not abandoned until 1804, though there was a 20th century attempt to revive it by R.H. Eddlestone. 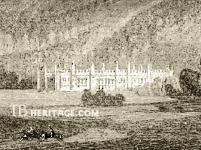 Gibside Park in the Derwent River Valley in the 19th century; the Palladian Chapel to the left, near the Tees River; The Column to the far right on the hill. Gibside House was substantially remodeled in the early 18th century, including adding an extra story on parts of the building. It also featured an elaborate Palladian stable block and numerous other outbuildings. The Bourchiers, an ancient family of anti-royalist leanings whose seat was Beningbrough Hall and its 1,000 acre park in part of Galtres Forest, near York, also owned the Barforth estate. Sir John Bourchier was a supporter of northern racing, especially at York. His daughter was Mrs. Gilbert Marshall, who married the owner of the Selaby estate, adjacent to Barforth. Gilbert Marshall's brother, Richard Marshall, was the royal stud master to William III, a post previously held by the near neighbours James D'Arcy at Sedbury, Rowland Place at Lower Dinsdale and Thomas Pulleine of Carlton Hall, near Aldbrough. Marshall spent most of his time at Hampton Court but made lengthy trips to North Africa on behalf of William III. In 1699 he imported nine stallions of Arab descent, one of which arrived at Selaby as The Selaby Turk. Not all breeders were successful. Sir William Chaytor (1639-1721) of Croft, owned a heavily entailed estate and spent much of time travelling to Newmarket and London in vain efforts to sell his stock and ease his financial position. He was eventually imprisoned for many years in the Fleet. "That good horse Marske bred by Mr. John Hutton at the hamlet of that name a few miles up Swaledale above Richmond had recently sired Eclipse. Fired by the success of his neighbour, Sir Lawrence set to work to establish a stud at Aske, and at an expenditure of £5000, found himself by the year 1776 the owner of a string of twenty-three horses of varying ages. He put the highest value - £1200 ‚ on Pontac; a four year old colt by Marske out of his mare A-la-Grecque, whose name appears in page one of the earlier editions of the Stud Book." Thomas, 1st Lord Dundas (1740-1820), continued his father's interest in the stud and supported local racing especially at Richmond. He was also patron of the Theatre Royal in Richmond, which opened in 1788. Despite money and enthusiasm the stud was not especially successful but the family did acquire Voltigeur, bred by Robert. Stephenson at Hart in County Durham. Voltigeur won the 1850 Derby and took part in one of the last famous matches at York against The Flying Dutchman in 1851, bred by Colonel Vansittart of Kirkleatham close to the southern bank of the Tees, a kinsman of the Turner family. Two important (and different) breeders from the North Yorkshire squirearchy, were Charles Turner (1727-1783) of Kirkleatham and John Pratt of Askrigg in Wensleydale (d. 1785 at Newmarket). Turner was a rumbustious character in the Fielding mode of an independent mind, with an extensive estate in Cleveland; he was interested in agricultural improvement and was associated with Arthur Young. In August 1795, his son, Charles (1773-1810), bought Hambletonian, Beningbrough and Overton from John Hutchinson, of Shipton near York, for 3000 guineas. Hambletonianwon the 1795 St. Leger for Turner, but the following year he married, and his father-in-law required him to give up racing. Hambletonian was sold to Sir Harry Vane Tempest Stewart. The magnificent Stubbs portrait of Hambletonian is now in Mount Stewart, former seat of the Londonderry family just outside of Belfast. It is owned by the National Trust and open to the public. A later breeder in the Tees Valley was John Bowes (1811 -1885), an distant relative of the late Queen Mother, who was born at Streatlam Castle, near Barnard Castle. He should have become Lord Strathmore, but his parents married nine years after his birth and the title passed to the Earl's brother. Bowes was an eccentric and private man. Although a member of the Jockey Club, in later years he rarely set foot on a race course. Nevertheless his alliance with the trainer John Scott of Whitewall at Malton was formidable, resulting in four Derby winners; Mundig (1832), Cotherstone (1843), Daniel O'Rourke (1852) and West Australian (1853). He was only 21 and still at Cambridge when Mundig (German for "of age") won the 1835 race. In later years he lived mostly in Paris with an unsuccessful French actress. He founded the Bowes Museum at Barnard Castle. Streatlam Castle housed a magnificent stud and was pulled down in the 20th century; another Bowes estate, Gibside Park, 40 miles distant from Streatlam, near the Northumberland border, was also the site of the Streatlam Stud breeding activity, and has recently received funding for the restoration of its ornate stables. ©2004 - 2005 Thoroughbred Heritage. All rights reserved.